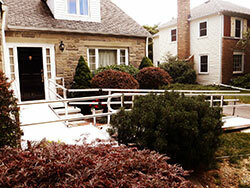 Braveheart is the Seattle specialist for wheelchair accessibility in your home. As a Preferred contractor for DSHS-DDD (Department of Social and Health Services-Division of Developmental Disabilities), Braveheart Construction and Remodel, Inc. has been making ADA modifications to homes and businesses since 2006. From Tacoma to Seattle to the coast, our crews have been remodeling buildings and homes for wheelchair and ADA accessibility and in the process, making the lives of disabled people easier. Whether you need ramps, lift systems or modifications to a bathroom or entire house, we are the ADA specialist in the Puget Sound area. We’ll work closely with you to find the best solutions to your mobility challenges. As the installer of SureHands Lift Systems, we have access to a variety of ceiling mounted lift systems to fit any building. All situations are unique and so we work closely with our clients to modify their Seattle or Tacoma business or home to fit their specific access needs. This means listening to them as they describe the ideal outcome and then, we use our creativity to make it come to life. The goal is a remodel that allows them the freedom to enjoy life. Need a wheelchair accessible shower? Being in a wheelchair changes the way you interact with the world and can make ordinary tasks difficult or impossible. This is especially true with bathrooms so remodeling for the disabled or wheelchair access presents many problems. This is where using an experienced contractor can make the difference between solving your problem and causing new ones. “Braveheart Construction did an amazing job. Brandon listened to my wants and wishes and did his best to fulfill all of them. They did a handicap accessible bathroom, floors, drywall, framing, kitchen, laundry area, deck and concrete walk way around my house. Braveheart has been installing SureHands Lift and Care Systems since 2007. Their lifts systems come in a variety of models and offer the perfect solution to your mobility problems while providing back saving ease for your caregiver. With a concern for the user’s quality of life, SureHands has improved their systems over the years to give the user more independence than ever before. “I began working with Braveheart in 2007 when I was looking for a new installer for SureHands Lift & Care Systems. After that first installation (which was part of a large home remodel), I knew this company had what it takes to be the installer for our systems. From their impeccable customer service to job site cleanliness and attention to detail, Braveheart has been my installer of choice for their lift systems ever since. Being a preferred contractor for DSHS-DDD means we have all the paperwork completed for bidding and performing work for the department. From installing wheelchair accessible showers to widening doorways, we make sure to remember every detail so you’ll be able to move around with little or no assistance.